We are in the Diwali season and advertisers are competing with each other to push information, to promote products and to persuade us to buy. What are some lessons that we can learn from them? Today, I’m going to share some techniques / lessons that we can learn from the advertisers. 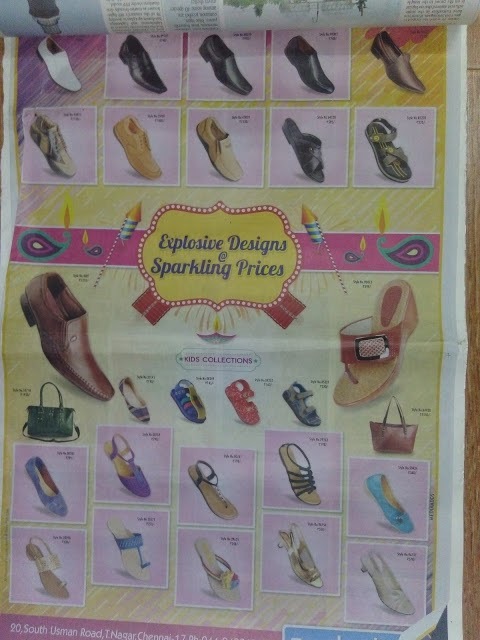 Look at these advertisements. 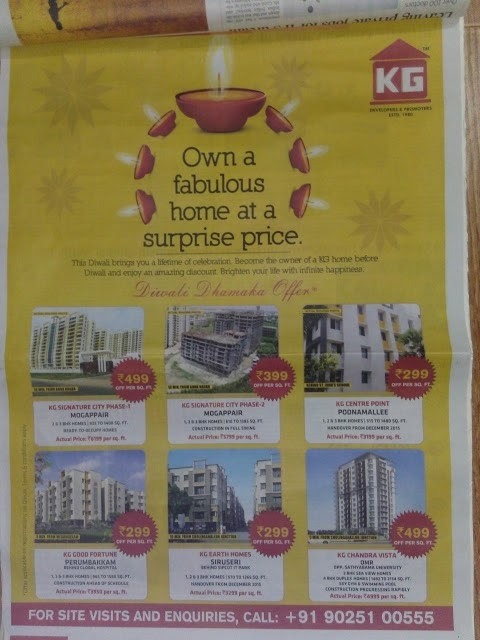 The moment you see this advertisement, what catches your eyes? Ad#1: "Pain Relief Without Surgery". 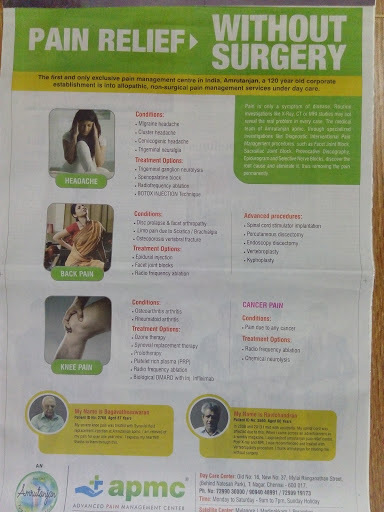 If you are someone who is going through a lot of body pain due to illness or if you know of someone who are going through excessive pain, this advertisement will force you to read the advertisement further. 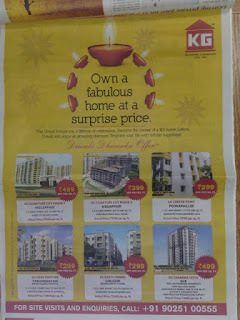 Ad#2: "Own a fabulous home at a surprise price". If you are looking for homes to buy, this advertisement will entice you to look at the various deals given below. We can use similar techniques to get audience attention, while crafting speeches. You can start with a quote such as "Good health is not something we can buy. However, it can be an extremely valuable savings account" or ask a startling question "Do you know that 90% of the diabetics are unaware of their condition?" It immediately hooks the audience with you. Look at these advertisements. 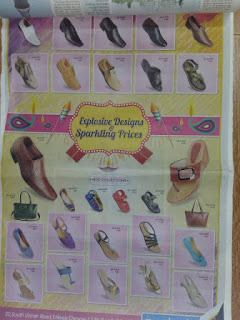 In the 1st advertisement, the shoemaker is trying to sell every type of shoe that they carry in their inventory. However, in the 2nd advertisement, Maruti is trying to sell just the Baleno. 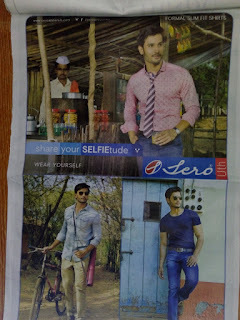 While Maruti has 20+ car models to sell, they decided to just focus on selling one thing, instead of trying to sell multiple things in one advertisement. 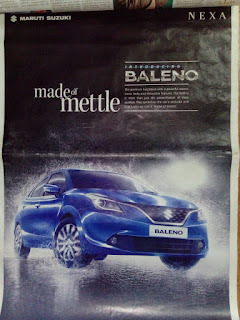 It will help the readers to remember Baleno, better. Similarly, through our speeches we always sell ideas, thoughts, products, services and at times, ourselves. Patricia a famous public speaker says "Life is a series of sales situations". It is very true. How do we make the best out of these sales situations. I've seen novice presenters carrying 30+ slides for a 30 minutes presentation. And, each slide will be like a word document filled with lots & lots of textual content. Instead, we should carry just 6 slides for a 30 minutes presentation. The extra information can be shared as handouts or sent offline via email. In Toastmasters, a 5 minutes speech can be used to convey only 1 main point and a few sub points. Look at these advertisements. 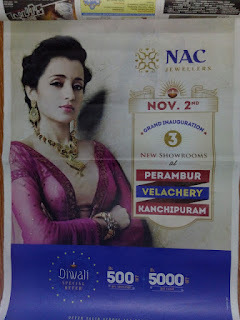 In the first advertisement, the advertiser is just showing the Golden necklace. However, in the second advertisement, NAC is trying to show how the Golden necklace will look on a beautiful girl, when she wears it. It helps the readers to visualize how the product / service will be of use to them. Similarly, in speeches help the audience to visualize by including stories / examples in your speeches. For example, instead of saying "Always split your goals into smaller tasks for you to quickly accomplish your goals", you can say "Imagine going to a pizzeria and ordering a pizza. After a few minutes of wait, your hot delicious pizza is served with your favorite toppings - olives, mushrooms, pepper etc., Now, when you are about to taste your pizza, I hold your hand and say that you'll have to gulp the entire pizza in one GO... you'll be sitting there thinking "How the hell that I'm going to eat the pizza without cutting it into slices". If I allow you to slize the pizza into smaller pieces, you will be able to comfortably finish eating the pizza. Similarly, your goals are like those large size pizza. You'll not be able to accomplish them in one GO, if you don't split them into smaller tasks. When you slice your goal into smaller goals, you'll be able to accomplish your goals faster"
Look at the following advertisements. The advertisers are trying to help us remember the message longer. 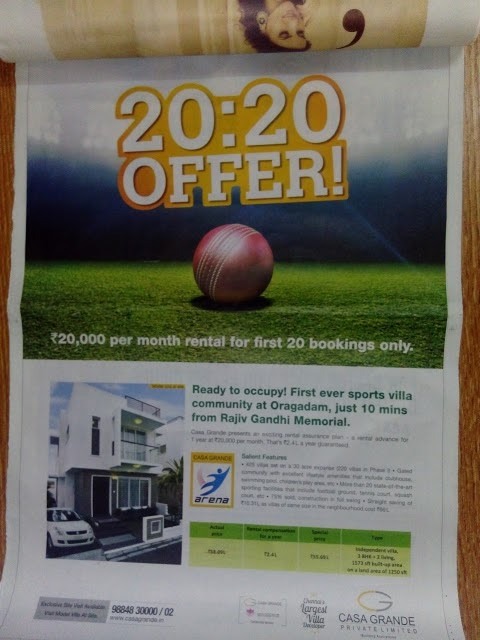 The first advertisement is condensing "20K per month for first 20 bookings" into a "20:20 offer" and that too by showing a cricket ball. The second advertisement is introducing a new term called "Selfietude" by combining "Selfie" + "Attitude". These are techniques that can be used to make an idea "stick"
Similarly, when we deliver complex information such as statistics, we can simplify them for audience to remember the information longer. For example, instead of saying "Ford sold 2,34,428 cars in this month", you can say "1 in every 10 cars sold in the city this month is from Ford". Another example is "If you want to be a successful toastmaster, you should follow the 3Rs - be regular to meetings, do enough research for your speeches, and rehearse your performance before delivering". 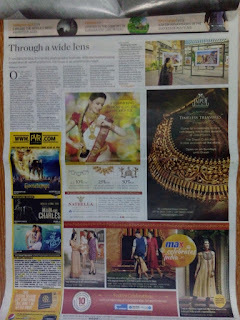 Dear friends, the next time you are reading the Sunday morning newspaper sipping a cup of hot coffee, don't just look at the advertisements and offers... look at what you can learn from those advertisements... so that, you can craft your next speech.